To say that Sy Smith is talented beyond her years is an understatement. She holds many titles and rocks them all with effortless style, steely determination and a passion for music that surpasses mere intrigue. The singer/songwriter, actress, musician, producer and record label owner has been on a mission for the last 18 years to show the entertainment world the essence of Sy Smith and all she encompasses in the worlds of Jazz, Nu-Soul and Electronic Pop. 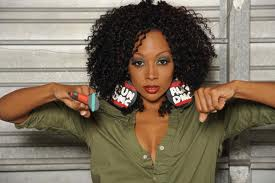 Mission deemed successful as the singer casts back over a stellar career that has given her four albums and over 20 singles, seen her work with the likes of Whitney Houston as backup singer, written music for Carols Santana and fronted UK funk group The Brand New Heavies on the off occasion in between album releases. I have been a firm Sy Smith fan since her 2005 release Syberspace Social, her soaring five-octave vocal range and in-your-face honest lyrics capturing resonating with me from the start. She has a quirky style and delivery that immediately intrigues her listeners, especially on her standout tracks “Aint Nobody’s Bizness” and “ Reach Down In Your Soul”. Her third album “ Conflict” . by far a firm personal favorite of mine is an album that still holds a special place in my musical heart with my favorite tracks being “ Fly Away With Me”, “ B-Side” and “ The Art of You”. “Conflict” went on to be nominated for Album of the Year from Soultracks. The NAACP Award nominated artist has merged her talents with a plethora of artists across the jazz and soul scope creating pure musical heaven on albums and EP’s featuring Anthony Hamilton, Meshell Ndegeocello & Foreign Exchange, to songwriting success with Usher, Eric Benet & Brandy. Clearly everything Sy Smith touches turns to gold! With her humble beginnings in Washington DC to her college life at Howard University campus, Sy’s earliest ambitions gleaned towards a career far removed from her star studded status. Graduating with a Bachelors Degree of Science in Psychology and a minor in Music Therapy, it is easy to understand why she possess the uncanny knack of penning music that hits a strong cord with your soul. Moving to LA shortly after college, Smith took it upon herself to pursue her dream of musical freedom and started the climb from aspiring artist to woman in charge. She now heads her own record label called Psyko!, stars in award winning movie and theatre productions like “The Seat Filler” and “ Black Rose” and drawing on her musical influences like Michael Jackson, Sheila E, Teena Marie, Prince and James Brown , Smith is setting a new standard for woman of Soul and Jazz and waves her flag proudly, holding court as Underground Queen of R&B & Hip Hop Soul. I so appreciate her time in doing this interview for me whilst in the middle of a concert tour in Paris, France …..thank you Ms Smith! Such an honour to interview you again Sy – we first connected some 7 years ago when I interviewed you about your Conflict album. Thank you for your time ……I hear your life has been keeping you very busy? Thanks for giving me a shout. Yes, life is pretty busy right now, but busy is kind of a constant for me, so it’s a good thing. I get anxious when I’m NOT busy. Your music is nothing short of heavenly sublime to the ears of a true music lover. What is the best way you can describe your sound and style? That is very kind of you to say. Thanks so much for that! I really don’t know how to describe my music, especially when I feel like I’m constantly shifting and evolving. My music is very free and very much about freedom, that is to say that it doesn’t lend itself very easily to categories. But most definitely an amalgamation of funk, electronic, jazz, and soul… It’s like when you mix up a bunch of fruity flavors of jelly beans and eat them at one time. Ya know? You like the flavor, but if someone asked you what it tasted like, you might be at a loss for words. You are singer, songwriter, musician, actress and music producer with 4 studio albums, over 20 singles in our career thus far …… when you first started out Sy what was your initial goal or mission in music? I didn’t have a specific goal. I was just trying to make music and push my own envelopes. I really just wanted to express my thoughts, tell my story and any other stories that came to me. You graduated from Howard University with a Bachelors Degree of Science in psychology and a minor in music therapy….. Had you initially envisioned a different career path for yourself at the onset of your college career to what you have ended up achieving? You have sung as a backup for Usher, Eric Benet, and Brandy and travelled with Whitney Houston, written for Santana and received an Emmy nomination for Outstanding Music and Lyrics for your single “Welcome Back “in 2002. So many amazing achievements Sy and that’s not even half of it …….. Can you share a particular moment that served as your high and low in your career to date and how that helped evolve you as an artist? I don’t think I can name one defining moment. I’ve gotten something truly special from so many of the experiences I’ve had. I really enjoy working with The Foreign Exchange crew in particular. But I’d be hard-pressed to name one particular high and one particular low. My career is full of both! Your music takes the listener on a journey through your soul. We feel what you feel, we see what you see though your songs. For me the tracks that resonate with my soul are off your Conflict album – “Fly Away With Me”, “The Art of You” and “B Side Love Affair” – that whole album took me to a place I had never been……. what is your mission when creating the music you do – how do you want your songs to touch or affect your listeners and what message do you wish your music to leave? I want the listener to find his/her own truth in my music. I don’t necessarily want people to see what I saw when I wrote the songs, I want them to see their own picture, to give the song their own tags per se. I think it’s really beautiful when someone comes up to me and gives me an interpretation of one of my songs and it’s a train of thought that had never occurred to me. It’s such an eye-opening thing to happen. Your biggest musical influences are great ones indeed – Diana Ross, Minnie Riperton,Teena Marie, Sheila E and Prince to name a few …… as a great singer / songwriter of our immediate musical generation what are your thoughts on the new wave of female R&B / soul singers in our charts today – do you have any advice or praise for them and the journey they are on compared to yours? Yikes, I wouldn’t know what advice to give really. Just be honest in your craft so that when you go back and listen to something you did twenty years ago, you can still stand by it. Your career has been richly rewarded Sy with nominations and awards from NAACP to Emmy’s to Soultracks Readers Choice – all varied in their own way but all honouring your hard work and passion – as an artist how important are these nominations and awards in the bigger scheme of things? Any accolade from my peers is always something that I’ll appreciate and cherish because I know how hard we all work to make quality art. Any interest in coming to Australia for a visit one day? Maybe do some shows? We would love to see a Sy Smith show ….. If you could host a music themed dinner party, who would you invite and why? I’d invite someone who can really throw down (cooking, that is)… cuz it won’t be me doing all that work! LOL! (smile again). Thanks for your time dear Sy and continued blessings on your amazing career. I thank you very kindly for having me Maxine……Peace… Sy! ← Jarren Benton – Against the Grain!